Click here to select your SILVER BULLET HAIR DRYER. 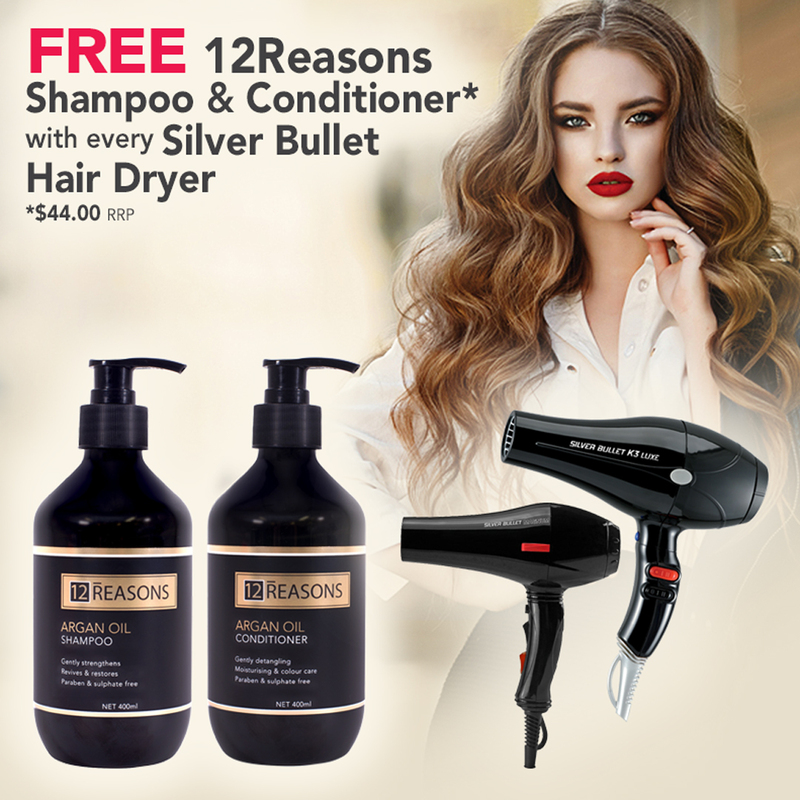 Click here to add your FREE 12Reasons Argan Oil Shampoo (400ml) and 12Reasons Argan Oil Conditioner (400ml). The cost of these items ($44.00) will automatically be deducted at the checkout. 12Reasons Argan Oil Shampoo transforms dry, distressed hair with moisturising and smoothing Argan Oil. Hydrating Coconut and Avocado Oil bring extra moisture, leaving dry and lacklustre hair looking luminous. This gentle shampoo revives and restores without impacting colour, softly cleansing and very hydrating. Experience the transformational ability of 12Reasons. Cleanse, detangle, colour protection, rich nourishment, anti-frizz, eliminate product build up, deeply moisturise, add brilliant shine, smooth, nurture dry and damaged hair, improve manageability and wont weigh hair down. 12Reasons for exquisite hair! *This offer cannot be combined with any other offer.